Cystal structure of iron bridgmanite with the iron phase shown in yellow and the silicon oxide phase shown in blue. View of the diamond anvil cell's interior: the bridgmanite sample is located in the centre. 21-Jul-2016: Using DESY's bright X-ray light source PETRA III, a team of scientists has discovered unexpected facts about the most abundant mineral on Earth. The mineral bridgmanite makes up roughly one third of Earth’s entire volume and is the major component of Earth’s lower mantle. Thus, its physical properties are one of the deciding factors for understanding the dynamics of our planet, with a direct impact on life on Earth’s surface, ranging from deep-focus earthquakes to geochemical cycles leading to formation of mineral deposits. 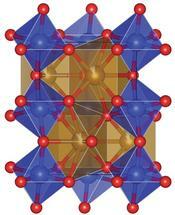 Bridgmanite is rather hard to study under its ‘normal conditions’ that are very high pressures and temperatures. Therefore many properties were discussed controversially within the scientific community. The new study revealed that bridgmanite can form an iron-bearing variety which has never been synthesised in laboratories before. This variety can indeed exist throughout the entire mantle and can change the view of the properties of our planet and its behaviour deep underneath the surface, as the team led by Leonid Dubrovinsky from the University of Bayreuth reports in the journal Science Advances. Additionally, the scientists discovered that defects within bridgmanite's crystal lattice continue to have a significant effect on the material’s properties even under high pressure, which was unexpected. “Our Earth is a dynamic planet and we can feel that every day, for example during earthquakes,” explains Hanns-Peter Liermann, head of the Extreme Conditions Beamline P02.2 at PETRA III, where the experiments took place. “Earthquakes can originate from different points within our planet, and in order to understand how they are generated and propagate, we need to understand the dynamics of our planet that are closely related to the minerals present in the interior.” The lower mantle takes up more than half of Earth’s interior, and up to 80 per cent of the lower mantle consist of bridgmanite. The experimental set up that was used for this study was a laser-heated diamond anvil cell (DAC). The bridgmanite crystal is loaded into a small chamber and compressed by specially cut diamonds to reach high pressures. Additionally, laser beams are focused on the crystal to heat it up to 3100 Kelvin (2827 degrees Celsius). 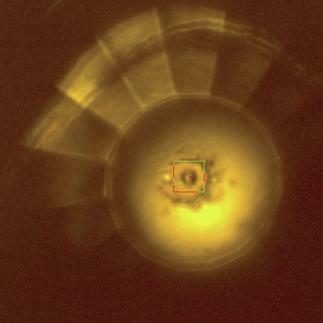 In this way the bridgmanite crystal is under high pressure and extreme heat while the X-ray beam is focused onto it. The bridgmanite crystal scatters the X-rays and from the resulting diffraction pattern its crystal lattice structure can be calculated. Additionally the scientists discovered that even the crystal synthesised at high pressures can still have a significant amount of defects. At first this seems counter-intuitive because one would expect that all defects would disappear when the material is compressed. The finding of an opposite defect behaviour emphasises the high flexibility of the bridgmanite structure and composition which is important for geochemistry and geophysics. “Understanding the properties of this mineral will help us to further understand the dynamics of our planet,” says Liermann.